COUNCIL BLUFFS, IA--Grundorf is the case and rack supplier for the 2007 Jagermeister Tour. Jagermeister is on tour nationwide with its Jagermeister Mobile Stage. The Jager stage is in a 44 foot long trailer. The stage itself is 34 feet long by 16 feet wide and 20-plus feet tall. The stage is completely self-contained and includes the sound system gear, lighting, rigging and power. Grundorf supplied 16 racks and four utility cases from the Tour 8 Series. The Tour 8 Series cases and racks are constructed of 3/8" laminated plywood with durable aluminum extrusion and heavy duty steel hardware. 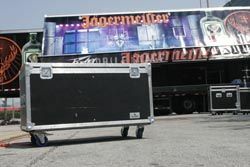 The Jagermeister Mobile Stage had its debut in March in Gainesville, Florida at an NHRA event. The big coming-out party will be at Ozzfest in July. The Jagermeister Mobile Stage will be the second stage on this year's Ozzfest tour. The Fall Jagermeister Tour kicks off in October. Check for tour dates at www.JagermeisterMusicTour.com.